Spence and Rach and 4 Crazy Kids: Speaking of Quince being accident prone! He tried to climb out of his exer-saucer toy and wasn't entirely successful. I love how he just sits there while you document this stuff. Too cute! 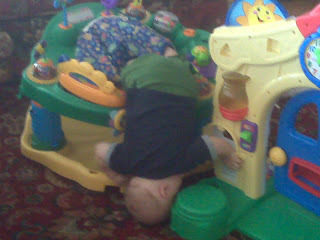 Kids do the funniest things! Your kids are gorgeous by the way ! I wouldn't believe it unless you had pictures to prove it. That's hilarious, poor kid, might need to start wearing a helmet! At least he's tough! rach all of your kids are the cutest i cant wait to see them! I totally agree with Mer - I think it's hilarious that he's just hanging out there upside down! What a cutie! Q is definitely accident prone. It's hilarious that you get pictures of all is accidents and spills! Rach I don't know how you do it, 3 kids and 2 dogs. You seriously are wonder women!! I agree with Kaci... how in the heck do you do it all?